This curious book, translated from Polish, presents details and historical photos of aircraft used or planned for use by the Japanese Navy and Army for special (suicide) attacks in WWII. The authors never clarify their criteria for inclusion of aircraft in the book, but it appears to be aircraft specifically designed for suicide attacks or ones heavily modified near war's end for use in suicide missions. Many of these aircraft never had production models, and the book's historical photos show aircraft not usually seen in works on Japan's Special Attack Forces. The book focuses on the aircraft themselves rather than personal stories related to their development and use in suicide attacks, so at times the text reads like an encyclopedia. The book appears to be directed at aircraft modelers rather than a general audience. The first quarter of the book covers the historical background of Japan's kamikaze operations, but it contains quite a few errors. The book's middle section introduces technical details, line sketches (generally 1/72 scale), and historical photos of ten Army special attack aircraft and eight Navy special attack aircraft. The final quarter presents remote-controlled flying bombs, eight used or planned for use by the Army and four by the Navy. The last 24 pages have color profile sketches of two or three aircraft per page, but these at times have an unclear connection with the main text since some aircraft are not included in the middle section on special attack aircraft. Even though the bibliography lists over 40 references, this does not mean that the authors accurately summarize the history of Japan's special attack operations in the book's first part. Mistakes abound. For example, Vice Admiral Shigeru Fukudome is introduced as the "third father of the Kamikaze" (p. 8), along with the first two fathers Vice Admiral Takijiro Ohnishi and Vice Admiral Matome Ugaki, even though Fukudome did not immediately go along with the idea of suicide attacks due to great concerns that they would destroy pilot morale (Inoguchi and Nakajima 1958, 67). The book refers to Army special attack squadrons as Shimpu (Kamikaze) units (pp. 15, 61), even though this term was never used by the Japanese Army. Kamata Flying School is given as the place where the first Army special attack squadron (p. 54), the Banda Squadron, was formed, but actually this was Hokota Flight School (Osuo 2005b, 8). Vice Admiral Ugaki led a squadron of 11 aircraft in the last kamikaze attack of WWII, and three aircraft in his squadron returned to base after taking off (Osuo 2005a, 140; Yasunobu 1972, 165). However, the book erroneously states four aircraft returned to base (p. 50). Despite the authors' statement that Vice Admiral Ohnishi got promoted to Admiral after introducing the kamikaze concept into combat tactics (p. 49), this never happened. Another false claim is the following statement: "Days after the armistice, Allied aircraft strafed the moored flotillas of suicide boats that had been prepared, to ensure they could not be used by fanatics ignoring the surrender" (p. 49). Such an event could not have happened as suicide motorboats containing explosive charges had been hidden in tunnels along the coastline of mainland Japan, so such motorboats would not have been visible or already would have been destroyed by Japanese not wanting them to fall into enemy hands. Japanese losses were relatively light, so the following day the Kikusui 8 formation was still able to operate [A]. The radar-patrolling destroyers were the primary targets again [B], as the destroyer USS Drexler was attacked at observation post no. 2 [C]. The attack began as K11W Shiragiku aircraft [D], led by Sub-Lieutenant Shigeru Kawada, emerged from low rain clouds [E]. In an intense attack, the destroyer received hits from five aircraft [F], and a series of explosions [G] killed 158 sailors and wounded 51. Eventually [H], fuel tanks caught fire and, following a large explosion, the ship turned over and sank. The USS Braine was the next destroyer to suffer [I], as one of the attacking aircraft fell on her deck and exploded in an ammunition store [J]. The ensuing explosion killed 56 sailors [K], and the ship overturned and quickly sank [L]. A. In this sentence "the following day" refers to May 26, 1945, but Kikusui No. 8 did not actually start until May 27 (Ugaki 1991, 619; Warner and Warner 1982, 259). B. Vice Admiral Ugaki (1991, 619-20), who led the Kikusui attack, gives no indication in his diary that "radar-patrolling destroyers were the primary targets." When he writes about the results of the attack, he does not stress destroyers in any way: "In spite of the small number of attack planes, the following results were confirmed in last night's attacks: three cruisers, one destroyer, and one big transport sunk; one cruiser and two unidentified ships torpedoed and set on fire, while one cruiser and one transport were also torpedoed but the result is unknown." C. The Action Report, Involving Loss of U.S.S. DREXLER (DD741) indicates that Drexler was at Radar Picket Station No. 15, not No. 2 as indicated in the book, when attacked by suicide aircraft (Brown 2002, 97-8). D. The destroyer Drexler did not get attacked by Shiragiku aircraft. The Shiragiku Squadron took off from Kanoya Air Base between 1801 and 1847 on May 27, 1945 (Osuo 2005a, 241), but Drexler did not get hit until 0702 the next morning (Brown 2002, 100). The article Who Sank the Destroyer Drexler? provides convincing evidence that Drexler was hit by two twin-engine Ki-45 Army Type 2 Toryu Fighters (Nicks) from the 45th Shinbu Squadron that took off at 0455 on May 28,1945, from Chiran Air Base. E. The Action Report written by Drexler's Captain indicates, "On the morning of 28 May 1945 the sky was clear except for scattered alto cumulus clouds, surface visibility unlimited, wind direction North, force 2, sea calm with small waves" (Brown 2002, 99). The Action Report makes no mention of "low rain clouds" indicated in the book Japanese Special Attack Aircraft & Flying Bombs. F. Only two Japanese aircraft, not five, hit Drexler (Brown 2002, 100-1; Warner and Warner 1982, 260). G. The Action Report written by Drexler's Captain (Brown 2002, 101) makes no mention of a "series of explosions." Instead, the Action Report states: "The warheads from neither torpedo mount were set off. The depth charges were not set off and none detonated when the ship went down." A Navy Department news release described the sinking after the second aircraft hit (Brown 2002, 111): "When the plane struck the destroyer at the base of the #2 stack, a tremendous explosion rocked the ship, blowing parts hundreds of feet and starting an immense oil fire. The Drexler rolled over rapidly on her starboard side and her bow lifted high out of the water. She sank stern first within 49 seconds after the last suicider found his mark." H. The book uses the word "eventually" with the implication that the ship did not sink quickly. The first aircraft hit at 0702, and the second plane to hit Drexler approached about 30 seconds later (Brown 2002, 100). The destroyer sank 49 seconds after the second hit (Brown 2002, 101). I. USS Braine was not the next destroyer after Drexler to suffer, since Braine was attacked at 0745 on May 27, 1945 (USS Braine DD-630 web site, Okinawa: "A Fiery Sunday Morning," http://ussbrainedd630.com/okinawa.htm, March 6, 2010), whereas Drexler was attacked the following day at about 0700. J. The survivors of the suicide attack on Braine do not indicate that the kamikaze aircraft "exploded in an ammunition store" (USS Braine DD-630 web site, Okinawa: "A Fiery Sunday Morning," http://ussbrainedd630.com/okinawa.htm, March 6, 2010). K. The actual number of persons killed was 67, not 56 (USS Braine DD-630 web site, Okinawa: "A Fiery Sunday Morning," http://ussbrainedd630.com/okinawa.htm, March 6, 2010). Warner and Warner (1982, 260) and Ugaki (1991, 619) state 66 men were killed. L. Braine did not sink even though the book indicates this. Braine was repaired and then decommissioned in July 1946. The destroyer was recommissioned in April 1951, sold to the Argentine Navy in August 1971, and finally sunk as a target ship in November 1986 (USS Braine DD-630 web site, http://ussbrainedd630.com/, March 6, 2010). 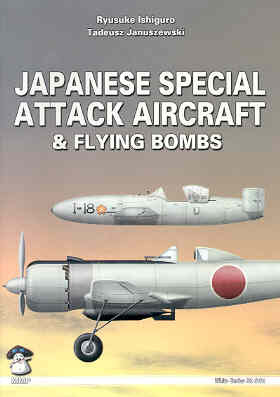 The value of Japanese Special Attack Aircraft & Flying Bombs lies in its technical details and historical photographs of Japan's special attack aircraft and weapons, but the book's first section on Japan's special attack history should be read with skepticism due to its numerous inaccuracies. Last moments before take-off of Kikka jet aircraft. under the wings near the fuselage. Osuo, Kazuhiko. 2005a. Tokubetsu kougekitai no kiroku (kaigun hen) (Record of special attack corps (Navy)). Tokyo: Kojinsha. ________. 2005b. Tokubetsu kougekitai no kiroku (rikugun hen) (Record of special attack corps (Army)). Tokyo: Kojinsha.